Hovhannes Tumanyan was a poet whose work has had such an impact on the literary life of his country that he is thought by many to be the national poet of Armenia. In addition to his own original work he translated many other writers’ work into Armenian, examples being the German Johann Wolfgang von Goethe and English romantic poet, the Lord Byron. Much of his work appeared in various periodicals such as Horizon and Hasker. His father Aslan, a priest, could trace his family roots back to 11th century Armenian royalty. It seems likely that the boy got his literary inspiration from his mother Sona who loved to tell him stories, especially fables. Hovhannes attended local schools until the family moved to Tiflis when he was 14 years old. He was already composing his own poetry and a literary career seemed inevitable. At the age of 30 he was a founder member of a group of writers and intellectuals centred on his own house in Tiflis, meetings being held in the attic rooms of the property. 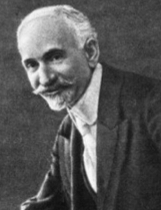 Other members included Alexander Shirvanzade and Perch Proshyan and almost anyone who played a significant role in early 20th century Armenian culture would be considered a frequent visitor to this group. It ran for at least nine years, up to the year 1908. He was always mindful though of the plight of his people and his own need to help them where he could. In the early 1920s there were refugees from Armenia scattered around Europe and Tumanyan decided to visit Constantinople in late-1921 to see if he could garner support for them. Unfortunately he contracted a serious illness whilst there and, on his return, was admitted to hospital for surgery. He did not appear to be making a proper recovery though and he was transferred to a Moscow hospital. His illness was clearly terminal. Hovhannes Tumanyan died there on the 23rd March 1923 at the age of 54.